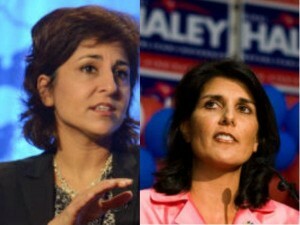 Washington, May 24 (IANS) South Carolina’s Republican governor Nikki Haley and Neera Tanden, president of liberal think tank, the Centre for American Progress have been named among 50 Most Powerful Moms of 2014 by The Working Mother magazine. Born Nimrata Nikki Randhawa to Sikh immigrant parents from India, Haley has made The Working Mother list for “breaking a lot of political ground”. Tanden who worked as policy director for Hillary Clinton’s presidential campaign has been recognized by Fortune as one of the Most Powerful Women in Politics. The Working Mother noted that elected in 2010, Haley is the youngest US governor in office, the first woman governor of South Carolina and one of two sitting Indian American governors. The other is Louisiana’s Bobby Jindal. Prior to being elected governor, she served in the South Carolina House of Representatives from 2005 to 2010. She graduated from Clemson University with a political science degree. Haley was inspired to run for office by none other than Hillary Clinton after hearing her as a keynote speaker at a leadership institute. Tanden, a graduate of University of California, Los Angeles and Yale Law School, worked on domestic policy for both the Obama and Clinton administrations and also for think tanks. She served as chief operating officer of the Center for American Progress before becoming president of the nonpartisan educational institute, and she was also senior advisor for health reform at the Department of Health and Human Services.